Our rear window graphic collection by GrafixJam features the artistic designs of John Rios. 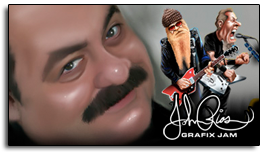 John has been a professional graphic artist for over 16 years. Throughout his career he has built a reputation as one of the most talented graphic artists in America. His work has been featured in magazines and on the cover of the Orange Country Choppers Calendar, and on designs for many musicians and professional sports franchises including the Motley Crue, Ted Nugent, NASCAR, the NHL and many others. His rear window graphic collection reflects his unique style and can be found only at VantagePoint Concepts. Please continue to check John’s page for new rear window graphics. For over 30 years Wild Wings has represented many of the top outdoor artists in the world. Their extensive collection features big game, wolves, upland birds, horses, Native American, fishing, ocean life, rural art and much more. VantagePoint’s exclusive Wild Wings series features hundreds of images for the outdoor enthusiast. Please view our Wild Wings rear window graphics collection today! Our Wild Wings rear window graphics have been officially licensed by Wild Wings. VantagePoint rear window graphics feature thousands of images from Wild Wings, Harley-Davidson, Cowboy Up, Mossy Oak, and our original series. Please browse our Series catalogs below to find the image for you! Are you interested in creating a totally unique rear window graphic at a reasonable cost? Our dedicated design staff can help you with custom artwork featuring unique phrases, pictures or other imagery which reflects your uniqueness. Visit our Custom rear window graphics section to learn more about our capabilities.